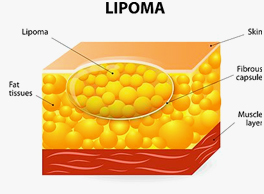 Lipomas are benign soft tissue tumors that are majorly a cosmetic concern. They can also be painful and uncomfortable. They can grow into the deeper muscle, push on nerves and interfere in daily or physical activities. found on the upper back, shoulders, arms, buttocks, and upper thighs. There is speculation that lipomas are caused by previous trauma. One theory is that injuries can cause fat to protrude through tissue planes in the body, creating a "pseudo" lipoma. Another theory is that trauma causes release of cytokines (a cytokine is a substance that is released by cells of the immune system. Cytokines can have powerful effects on other cells of the body). These cytokines may then cause abnormal growth of fat cells. However, to date, there is no proof that trauma causes lipoma. The causes of lipoma are still poorly understood. While the exact cause of lipomas remains uncertain, there has been found to be a genetic link to solitary lipomas. This was found on chromosome 12. It is causing symptoms such as pain, numbness or limitation in motion. The mass is larger than 5 cm in size. 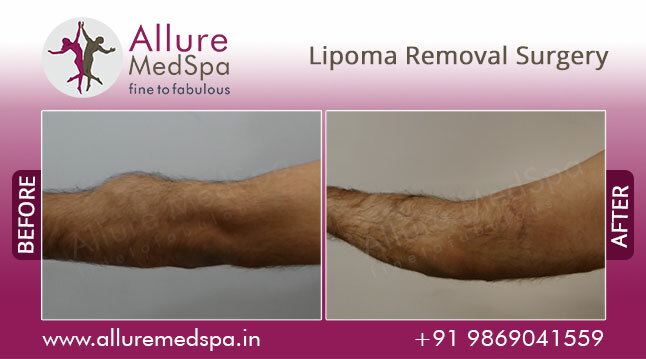 Lipoma removal is the excision of uncomfortable, fatty tissue growths or lipomas. These growths develop directly under the skin and are one of the most common growths seen on the body. Although benign lipomas do not pose any life threatening concern, these growths are painful and uncomfortable. They can grow into the deeper muscle, push on nerves and interfere in daily or physical activities. This is the medical justification for removal, and the tissue is sent to pathology to confirm it is not cancerous. Lipoma removal surgery often only requires local anesthesia and can be performed in approximately 30 minutes, but this depends on the size and number of the lipomas and the method of removal. 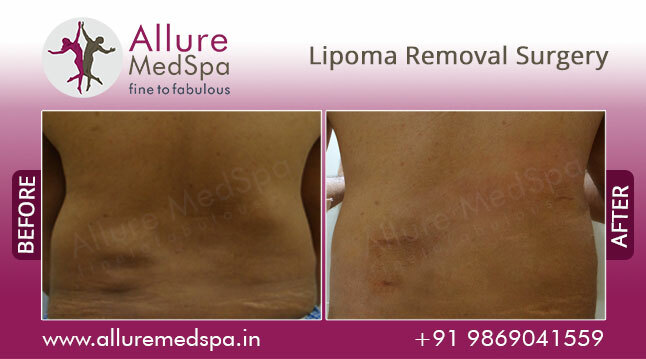 Liposuction allows the removal of the lipoma through a very small incision. 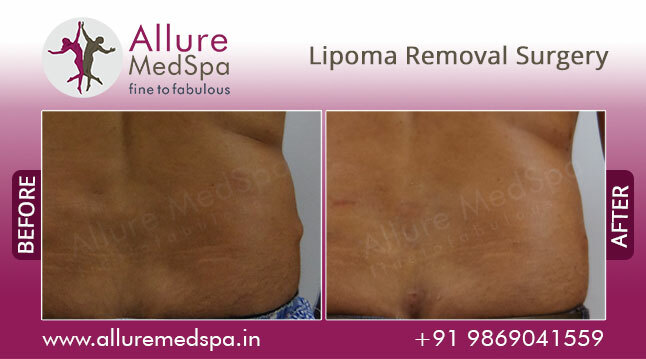 The incision required for liposuction may also be placed in a more remote inconspicuous location. Liposuction is often used on small facial lipomas because a favorable cosmetic result can be obtained through remote incisions. 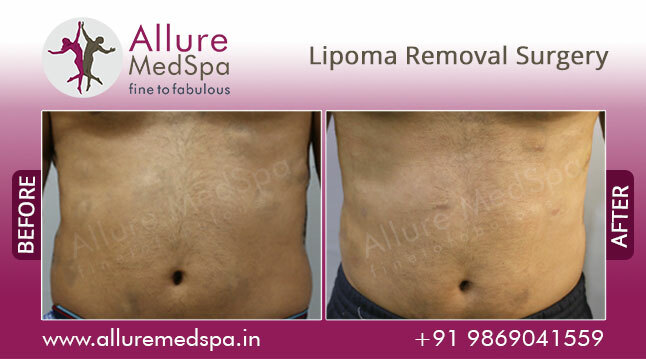 Liposuction can also be used for medium-sized (4-10cm) and large (>10cm) lipomas. 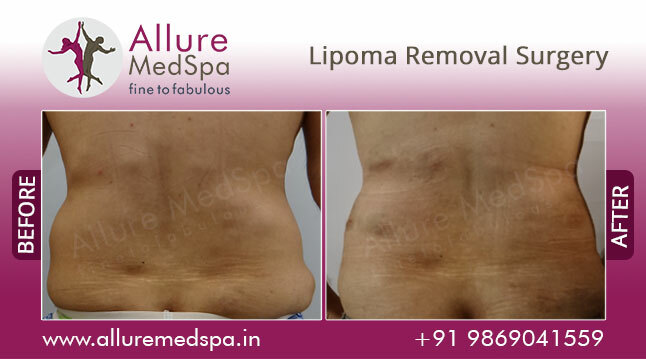 The disadvantage to liposuction is that residual fat cells may be left. This increases the chances that the lipoma may regrow. Another disadvantage is that liposuction does not allow for complete evaluation of the entire tumor. 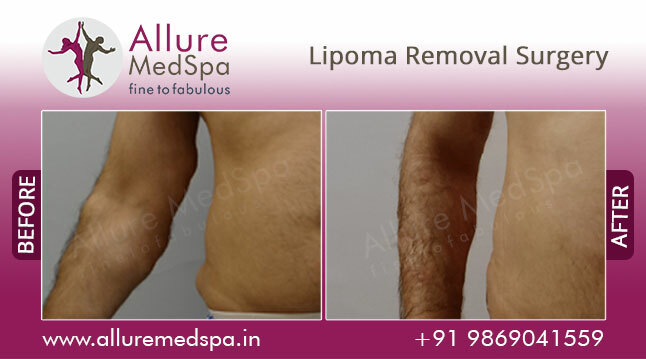 For very large lipomas, the liposuction method allows for a smaller incision. Dr. Milan Doshi will use this incision to vacuum the growth from the beneath the skin. Although this technique is less invasive, it is more difficult to guarantee the complete removal of the fatty tissue. 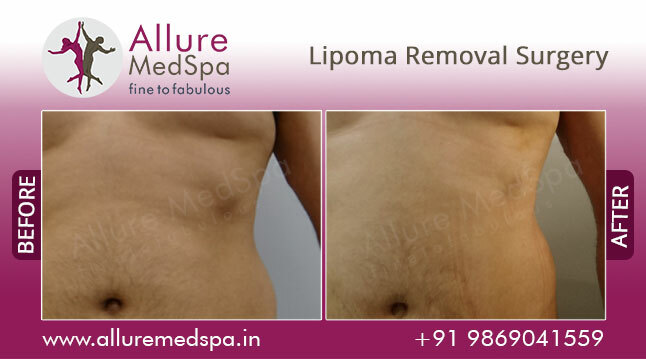 Superficial lipomas are commonly removed for cosmetic reasons, and hence, a cosmetically pleasing incision should be used. The incision is usually placed directly over the mass and oriented so that it is hidden by natural creases or wrinkles in the skin. This improves the cosmetic results. This method is used more frequently. The skin is incised over the lipoma, and the fatty tissue is meticulously dissected away. The dissection technique may, in selected cases, be combined with a “press and squeeze” method. It’s analogous to delivering a baby through a small access area. After the lipoma has been completely removed from under the skin, the incision will be meticulously sutured closed with dissolving sutures. Complete surgical excision of the fat cells and fibrous capsule is highly recommended to prevent the mass from re-growing. The size and location of all lipomas differ on an individual basis; your surgeon will discuss which technique is most appropriate for you. One of the common cosmetic and reconstructive surgery procedures, Dr. Milan Doshi performs is lipoma removal. During your initial consultation, Dr.Doshi will evaluate your health, determine where your lipomas are located, how much they impede movement or interfere with daily activities, and carefully access the technique best suited to remove your individual lipomas. The decision regarding type of anesthesia is dependent on the size and location of the lipoma, in addition to mutual agreement between surgeon and patient. Normally, the individual can go home once the procedure is completed. The Lipoma Removal procedure is usually completed in a few minutes’ time. The recovery period after lipoma removal depends on the size and location of the lipoma. Typically, patients can return to work and resume light activity after a week. The cost of Lipoma Removal surgical procedure depends on a variety of factors. At Allure MedSpa, we don’t simply provide surgical solutions to conditions; we recognize your needs extend beyond the surgical procedure itself. Our comprehensive aftercare program focuses on your unique, individual needs. Our surgeon doctors and support staff will be accessible post-surgery too. Imaging modality, if the physician deems it necessary. Medications that increase a person’s chances of bleeding and it may be recommended to discontinue them for a period of time, before the procedure is performed. The patient must avoid eating or drinking at least 8 hours prior to the surgical procedure, depending on when the procedure is arranged and what kind of anesthesia will be used. A complete recovery from Lipoma Removal procedure is normally achieved. The prognosis is usually excellent, without any serious complications being noted. 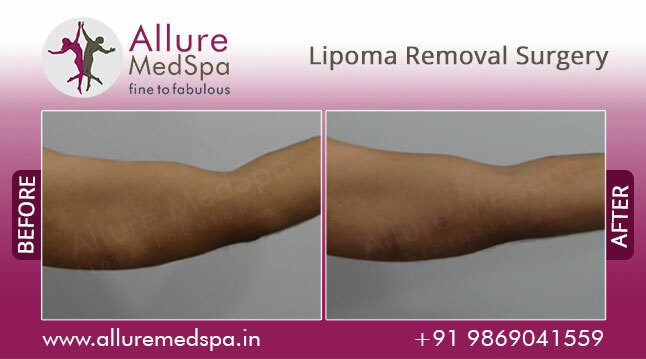 View More For Lipoma Removal Surgery Before and After Images.